Look no further for absolutely low price shipping to Burundi, For Courier Force is here for all your needs.The land locked country of Burundi in the south east Africa is amongst the five poorest countries in the world. Even though Burundi has sensitive economic system many individual and companies have the need to send parcel to Burundi from India and Courier Force is chosen to deliver packages to different corners of Burundi. 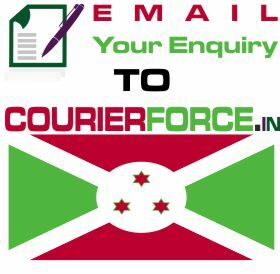 It comparatively very easy to send packages to Burundi from India to family members or Colleagues or business partners in Burundi if you choose Courier Force. Each of our low price Indian couriers to Burundi understands how critical it really is that your particulars reach the desired destination in due time as well as in good condition, so that you can depend upon Courier Force to ensure the safety of your packages. With years of experience we can easily arrange a low price, swift and efficient parcel delivery to Burundi for your goods.We provide you with live online assistance and also provide you with free online tracking no. after booking your parcel. 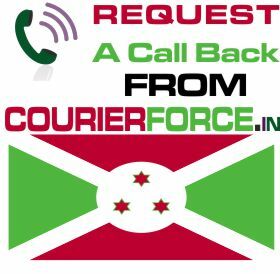 Contact us now and book your shipment to Burundi with Courier Force. Prices below are door to door courier rates to Burundi from India. These charges are cheapest in India for sending courier to Burundi from India. This is by a courier company which is the best in industry for parcel services to Burundi. 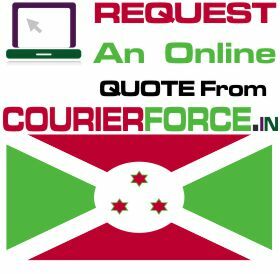 Again, Courier Force is one of the very few companies who have their own network for distributing parcel in Burundi. It will take anywhere between 3 and 6 working days to deliver your parcel to Burundi from India. We will be simply collecting the parcel from your business or residence in India and delivering it to your destination address in Burundi. Duties, taxes and customs charges if any (in Burundi) will be additional.